There’s a library known as Electron which allows web developers to package their content into a desktop application. It is a little controversial because — frankly — what isn’t? Detractors say that web applications are not efficient. However, in this case, it isn’t like you have a way to make a “proper” GMail desktop app, so it probably isn’t much worse than just having GMail open in a browser all the time. In theory, you could just use Electron to “develop” your own version of GMail or whatever app you like. However, that takes a little time. Instead, I’ve been using nativefier to do the job mostly automatically. The program can take just about any web page or application and make it a Windows, Linux, or Mac application. The program tries hard to just do the right thing. So if you install it and just run the program with a URL it ought to figure out the right name, the right icon, and so on. However, there are a few things you should know. Let’s say you want to make Microsoft’s OneNote into a Linux application. 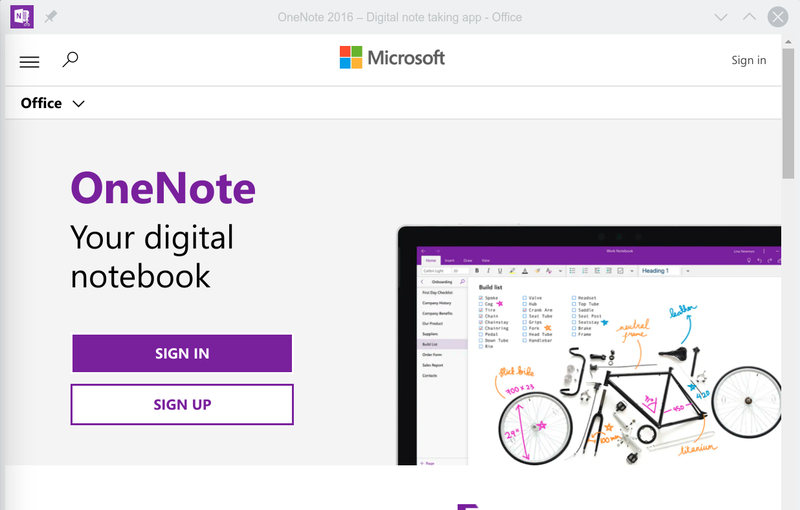 Yes, there’s already a OneNote app, but not for Linux. It sort of works under Wine, but the web application is the one that gets the updates now and it works smoother than using Wine. Your first attempt might be: nativefier onenote.com. There’s a problem with that, though. While the program picks up all the relevant data, it doesn’t keep your main browser’s passwords and cached login credentials. Therefore, you’ll need to log in. Oops. Clicking the sign in button takes you to another Microsoft web site and that causes the program to open that in your regular browser. Logging in there doesn’t help you any. So does that mean you can’t use nativefier for OneNote or anything else that has a login? Not at all. In English that says if the URL ends in .office.com, .onenote.com, or .live.com, it is internal. It also catches go.microsoft.com. I could probably have just grabbed all of microsoft.com, too, but if you had a real external link you might want it to go to the outside browser. Again, you can adjust this as you need to. If you know you’ll never link out of the app, you could just use . * as the regular expression, but that seems lazy. If you don’t use the browser like I do, this may seem like a waste of time. Or maybe you have another technique to deal with browser tab bloat. But if you want to turn that web app into a program, nativefier seems to work well and definitely makes my workflow easier. There are a few problems, though. For one, spell checking doesn’t work inside these applications. So maybe WordPress isn’t a good one to convert after all. But for some apps, like the circuit simulator, you probably won’t miss spell checking. There’s a feature request on GitHub to add this and if they manage that, it would make it even more useful. emacs is the OS, Linux is the HAL. Websites are at least supposedly are sandboxed so they are not as much of a risk as running native binaries. But this is getting worse and worse though as browsers expose more and more of their host operating system’s functionality. The benefits of using a website instead of a native app are quickly disappearing, while the drawbacks have only been somewhat mitigated. We’re getting to the point where browsers are worthy of the decades old criticism Emacs has received. They have eventually become an OS with many fine features – simply lacking a good web browser. The dumb terminal gets re-invented every generation, and disappears for the same reasons: it’s slow and fragile, uses up tons of resources for a gimped version of the same software, and the applications eventually break down on you without an offline fallback. Another issue with online software is the “In construction” problem, where, since the software isn’t locked to a distribution version anymore and they keep changing it continuously until the users get pissed off. It’s never “done”. A third problem is “software as a service”, where the publishers are increasingly trying to lock you down to paying monthly fees since they can keep monitoring your use online. Those “small” payments end up costing a lot. Fourth problem is the continuous streams of ads, which make the software “free”, except you pay anyhow because the companies put the cost of those ads into their prices, so the more ads get served the more you pay – even for ads in software that other people use. That’s just the ads industry helping themselves to your wallet. In other words: it’s not going to be long until people get fed up with apps running in a browser, just like they did with JAVA terminals etc. and return to native apps they can own and keep. Yes, it does seem that way, and if your predictions fail. it isn’t from lack of truths (same one’s used last time) but not acknowledging that there has been significant progression from last time. From hardware of all kinds, to our better understanding of problems and the CS we use to solve them. This is not our grandparents future. I”d say the benefits of a web application are now non-existent. Not only do they have the same access to the OS a local application would use, but you now have no way of figuring out what is going behind the scenes, where you data exists, and now you must be connected tot the internet at all times just to even get access to your data. Plus, not only are you having to trust the company at the authors at the time of writing, but now you have to trust them in perpetuity. You are also adding a bunch of risks i the from of the rest of your network, your ISP, the intermediate NSPs, the application operator’s ISP, their networks, their hardware, and so on. Then you also have to worry about the stability of the author of the application. What if tomorrow they suddenly pulled the plug and now you no longer have access to your data or now just have a big blob of data in some proprietary format that you have no idea how to process. I’m reminded of one of Remond’s early fears about browsers. That they would eventually render the OS irrelevant because that wasn’t what developers, developers, developers were writing software to. The browser had become a form of virtualization. Write for…run everywhere. MS Notepad supports linux line endings now. nano and none of the fluff! Are we apps not full programs? People who use Chrome on Linux also can’t complain about MS and Windows being bloated spyware. Does that imply that people who don’t use Chrome on Windows can’t complain about Chrome being bloated spyware? Seems like it should… mutual exclusion. Well, keep reading. I boot Linux. And about 90% of what I do is inside Chrome. So wht not chromium hmm???? Fire was two holidays ago. But is OS choice really as relevant as it use to be when even home virtualization (and hardware) is so cheap and easy to do*? One can run from the oldest to the newest irrespective of platform complete with associated applications. Images of all types traded as easily as candy, from containers to VMs. *Even GPUs can be virtualized, let alone pass-through. But it still kindles warm memories. Hmm, I don’t really use a desktop on my linux. I read that I thought, isn’t that exactly the sort of personal workflow that the linux desktop encourages? I really want an offline version of the latest Falstad simulator, so I don’t have to worry about the browser crashing every time I’m out of wifi range. So I’m thinking about this, am I’m like, cool. But then I’m like, how is this any different than tabs or just another window? Now you have tabs on the task bar. or you could just pop a new window then that is a tab on the task bar. I think, well it let’s you open and close the window without thinking about it, i.e. remembering the url, all the clicking just to get to said webpage. Then I’m like bookmark? well then I have to dig through my bookmarks. Then shortcut on the desktop or start menu. I’m hard pressed to say that isolating a webpage in it’s own process is advantageous. other than security, why? ^This. The solution might be to close some tabs, not that I’m any better: My Firefox tabs scroll left and right and the Chrome tabs no longer have space for the favicon. It amazes me to think that there was a time when browsers didn’t have tabs though I wonder if it was better that way. I need to thin my gnome-terminal tabs too. Any tips? I’m not great at doing this, but what I have is a wiki with my project documentation and most of my web pages that I don’t want to close are related to one of them. So I try to put them there when I clean up. The other solution is that I have 5 monitors. So each monitor is a type of work. email/social/phone stuff, research, network management, house status. etc. also I break up activities into windows, stuff I’m trying to buy verse the other stuff I listed. Each group gets it’s own window. I don’t like these web apps posing as standalone… they always seem to forget your credentials. Worst offender is a local car sharing app that suddenly doesn’t know me any more when I’m in a hurry and it’s raining. I just don’t see why an app that should only take a 20 megs of ram has to take up 200 just cause web “technologies” are trendy. Your definition of “should” is probably just wrong. I can’t relate to this whole the desktop is dead, everything is web thing. Granted, I do usually have a web browser open at the same time, mostly for use in looking for help with those other 3. How did I forget Inkscape and Gimp? I spend tons of time in those too! Ok, I probably use the Anki Android app more than the linux application but there are card edits and reschedules that can only be done from the desktop application so I need that too. How long till Google makes it so you have to have Youtube installed to watch any video file on Android devices? All they can really do is force people to use HTTP headers that mimic their desktop; there is a limit to what they can do without causing the website to also stop working for a lot of people. And it does support spellcheck, although the setting is marked as ‘experimental’, and currently only works in English (https://github.com/Automattic/wp-desktop/issues/101). I do wonder: aren’t you aware of the chrome built in feature to create a shortcut ie on your desktop which launces the webapp in a standalone window ? With a nice I on etc? Yes. It is either running on my own computer, or someone else is stealing (errrm, using) all the data (AKA cloud, online, blah blah). How did you get Android Messenger working? It never seems to progress for me. Just two words: Thank you! I used to use Prism to do the same thing, and have occasionally rolled a trivial xcode webview app, but “canned” is just great. Hoorah. Chrome’s “create shortcut” feature used to do this for you automatically, but it doesn’t appear to anymore. Why don’t you just make desktop apps from web apps in Chrome, without using bloated Electron? In Chrome, go to the hamburger menu -> More tools -> Add to desktop or menu -> Install to desktop. This isn’t AOL. We don’t do “Me toos” around here. But… 640 MB ought to be enough for anyone! There is also RamBox (http://rambox.pro) which has convenient wrappers for many web apps, but mostly focuses on messengers and webmail urls. You can add arbitrary urls as tabs though..